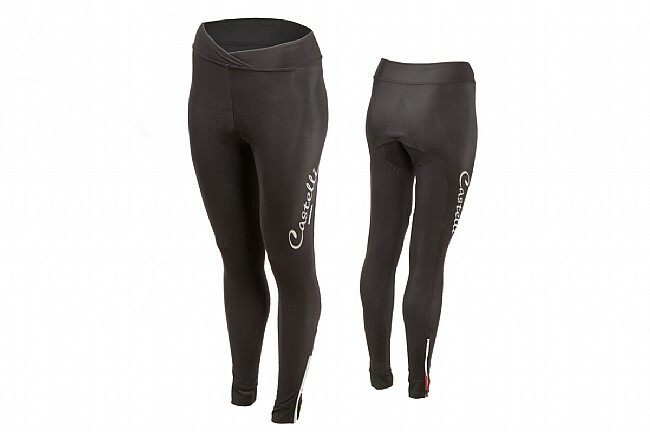 For wet and cold conditions, Castelli's Women's Nanoflex Donna Tight is at the top of the list. Using five-phase nanotechnology treatment, the fabric of these tights simply sheds water when the rain starts coming down, but when it's dry, Castelli assures that this fabric is just as breathable and warm as their benchmark Thermoflex fabric. To get the most out of this water-resistant treatment, seams are kept to a minimum, and the ankles feature GIRO3 grippers that lie flat and seal tight against shoe covers. A KISS Air seat pad provides excellent comfort with its anatomic shape and continuously variable thickness, and for easy on / off, YKK® camlock zippers are located at the ankles. Features reflective accents front and rear to increase visibility.